Bathrooms are an important part of the home. They offer a personal retreat for many people after a long day. Therefore, it is in the interest of members of the household to decorate this area tastefully for purposes of making it luxurious. Bathroom remodeling has become an important interior decorating project. As a result, modern bathrooms are featuring vibrant colors, varied pieces of furniture and remarkable designs. Homeowners are going to great lengths to hire the services of interior designers to perform the task of generating an extraordinary retreat. Accessories: Accessories include decoration, wall hangings, art and sink essentials such as cups, toothbrush holders and the like. It’s a good idea to begin with a unifying theme—one that continues to be popular is the beach motif, with either sand-colored paint or shell-print wall paper, murals of shore scenes, seas shells in baskets, etc. Remember not to overdo it, as too much clutter makes a room appear smaller. Be sure to pick out your colors and accessories to match. Clearances: All fixtures should be at least 30 inches apart, center-to-center, and 15 inches from the center to the nearest wall or obstruction. There should be 30 by 48 inches in front of the sink. Allow 24 inches around the toilet. Allow 45 by 30 inches in front of the tub. Allow at least 32 inches for all walking areas, including doorways. Double bowl vanities require 60 to 72 inches of space. Colors: Bright colors add light to a room, especially which can be useful for rooms without windows. Pastel colors make the room appear larger. Too many colors in a small space can add to the busyness of a bathroom, not to mention stress out users. When in doubt, use white. It goes with everything. Countertops: There are many alternatives on the market when choosing countertop finishes. Tile is still popular. Solid surfacing, such as Corian, Avonite, Nevamar and Wilsonart, gives the convenience of one-piece construction and tends to be low-maintenance. Fritztile is a polyester resin which can be laid like tile, but it is seamless with no grout lines. Formica is still a low-cost alternative. Flooring: Whatever your choice, whether it’s carpeting, tile, wood or stone, the most important feature of bathroom flooring should be a non-skid surface. Floor plan: A few simple rules apply here. For instance, you should never lay out the bathroom so that the toilet is visible from outside the bathroom, nor should it be the first thing you see when entering the bathroom. Lighting: Most bathrooms have inadequate lighting, thanks to their lack of windows. It’s worth looking into installing a skylight or two to brighten up the space. If it’s not feasible, halogen and fiber optic lighting help to brighten up the bathroom. Mirrors: Mirrors make any room look bigger. Fell free to use mirrors liberally in a bathroom space. Don’t put more than one per wall, however, as it adds to visual confusion. Mirroring an entire wall makes the bathroom appear twice as large. Paint/paper: Any wall covering used in the bathroom must be water-resistant, but damp-proof as well. Unless applied properly, paint and paper can peel and bubble. Safety: Protect all electrical outlets with a ground-fault circuit interrupter and place all switches more than 60 inches of water sources. Mount grab bars near toilets and tubs, and inside of shower units, ensuring that they’re installed into studs and not just drywall or tile. Install two grab bars in the shower, one at the entrance and one at the water source. Angle them at 45 degrees. Showers: Showers have become more elaborate over the years. 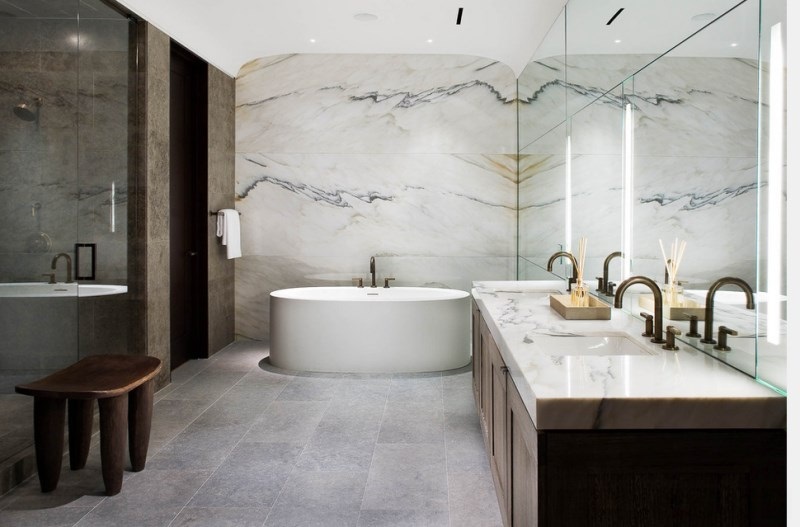 There are units costing in the tens of thousands of dollars, showers with hydro-massage, waterfalls, multiple shower heads, benches and electronic controls. If you’re installing a shower separate from your tub, it should be at least 32 by 32 inches. The trend is toward larger showers. Install swinging doors so they swing outward to avoid trapping the user. Benches or footrests should be at least 12 inches deep or more. Sinks: The hottest design in sinks these days are vitreous china pedestal sinks because of their sleek lines and design details. Many people still prefer the vanity-type sinks because of their greater storage and surface area. It’s not necessary to have a double-bowl sink unless two people will use it at the same time. Storage: Many wonderful, inexpensive cabinets, shelving and racks available. If there’s extra space near the toilet, buy a short cabinet in which to store toilet paper and toiletries. If there’s no space, an over-the-tank shelving unit may be best. Toilet roll holders should be mounted 26 inches off the floor to the front of toilets. Measure all storage doors to make sure they swing clear of fixtures. Don’t forget to allow storage space for cleaning materials, linens and medicines. Tubs: There are now more than 400 styles, including whirlpools, Roman tubs, and spa systems. A few standards apply here. Platform-mounted tubs should be no more than one step off the floor. The step should be no more than 7 1/4 inches high and at least 10 inches deep. Sunken tubs are an accident waiting to happen. Faucets should be within reach from outside the tub. Install grab bars. Ventilation: A bathroom without adequate ventilation can contribute to rotten drywall, peeling wall paper and bubbling paint. Installing an inexpensive fan (many come with lights in them) can reduce dampness.